When you think of Michigan, you probably think of places like Detroit, Ann Arbor, and the UP (Upper Peninsula). We have visions of automotive companies, great lakes, and rival college football. Not to mention the Lions, Tigers, Pistons, and Red Wings. But about 30 miles north of Detroit, is a small town called Rochester Hills, that is the home of one the most well stocked humidors in the area. That humidor is in Goodfellas Cigars Inc. Located on 2944 Rochester Rd S, Rochester Hills, MI 48307. I was visiting the area for business and after work on a Friday, before I had to catch my plane I wanted to enjoy a cigar. I was told about Goodfellas Cigars Inc. from, well some Good Fellas I know in the industry and decided to pay them a visit and kill off a couple of hours before heading to the airport. Ian, the shop manager, greeted me when I entered the store with a smile and a warm welcome. He showed my around the shop and I must say if you own a shop you want a manager like Ian to run your place. He is most knowledgeable on the brands carried and is quite capable of finding you something that meets your palate should Good Fellas not carry your particular go to smoke. So as we walked through the humidor I noticed he had most everything I like, but as usual I asked, “What’s new?” Ian asked what my flavor profile was and I explained I run the gamut but prefer a stick that has decent flavor and some strength. He paused me for moment, and said one word he can’t stand is the word “stick” to discuss a cigar. He said so much work goes in to the development of the cigar that it deserves to be called a cigar not a stick. I agreed with him and have taken that to heart, so I will use more creative and artistic words to discuss cigars in the future that pay proper tribute to the art, science, and craft of bringing that flavorful leaf to my palate. That is the kind of man Ian is, a true Brother of the Leaf. With that said, he promptly introduced me to the new Room 101 Uncle Lee which we review in this issue and yes it is an amazing cigar from Matt Booth and his team. After we left the humidor he showed me around the shop and introduced me to some of the regulars as I sat in the back and fired up the Uncle Lee and relaxed for before I had to part for the airport engaging in typical cigar shop conversation and making new friends. I hope to be back up in Michigan soon and be able to swing by Good Fellas again. I highly recommend you visit this shop if you are ever in the area, and let them know Boston Jimmie says hi! Goodfellas Cigars Inc. is open 7 days a week starting at 10 AM and closing at 9 PM except Sunday when they open at Noon and close at 6 PM. This entry was posted in Cigar Lounge and tagged cigar lounge, cigars, Detroit, Goodfellas, Goodfellas Cigars Inc., Michigan, Rochester Hills. Bookmark the permalink. I visited Goodfella’s cigar lounge last week, was in the country (from Dublin) visiting realtives. It boasted a very nice humidor with a great selection. The guy behind the counter turned out to be the manager, his name was Ian, personable guy (but badly in need of a haircut). 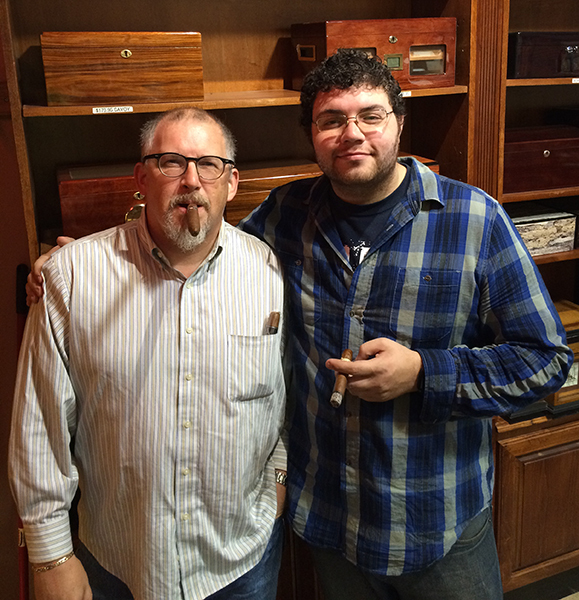 Ian showed me many quality cigars and helped me pick the right ones for me. I asked a lot of questions and he answered them all, but when I asked if he could get me a Cuban or two, he muttered something under his breath, I think he was asking about my mother’s health? Anyway, the lounge chairs were excellent, very comfortable and a huge TV was there to watch. After getting to talk toa few of the regulars, I asked Ian if he could turn the thermostat down a few degrees as it was getting warm in the lounge. He stared at me and said :”figure it out, if you do I’ll throw in a box of cigars we keep under the water heater, FREE! ” I didn’t know what that meant, but he seemed to be almost arguing with a guy up front at the time who was at least 6’8 and 300 lbs, most likely his boyfriend. I didn’t want to overstay my welcome so I used the luxurious bathroom in the back of the lounge, but when I washed my hands there was no towels in sight to dry my hands. I made sure to tell Ian that the very large black man who was in the bathroom just before me probably took the towels. I’ll definitely be back to Goodfella’s, good cigars at reasonable prices, but I’ll know not to disract the manager with my frivoouls requests, or sit next to to the non-stop talking roofer guy who was there.